This is one long tube of steel. You can see the spacer rings attached. Notice I was sent the XL size, which makes a 2 1/4″ diameter plug. In September I was contacted by Bill Carney, who offered me a Pro Plugger to review. The ProPlugger is a long tube of steel that you drive into the ground with your foot. You can make several holes in succession and all the plugs are stored in the tube. Spacer rings can be used to adjust the depth of the hole you make. Without spacer rings it makes a six inch deep hole. It seemed to me this tool had several advantages over other bulb-planting tools. I was getting ready to plant a bunch of bulbs that I had dug from my old garden, which I thought would be the perfect opportunity to test it and report the results to you. I have been planting daffodils in rough grass for years now. When you live in a rural location, it’s a great way to add a big splash of color in spring. Previous to this year, I had used a planting bar similar to the one pictured at right to plant in the edges of fields or along the roadside. You jam it into the ground, and then pull back. This creates a wedge-shaped opening which is narrowest at the bottom and widest at the top. Since a daffodil bulb is widest at the bottom, you have to really push it down to make sure the bottom has contact with the soil. Then you just stomp on the grass to close up the hole. I have always been suspicious of bulb planters similar to the one pictured at left. Most of them look flimsy to me, and while they might work in deeply dug garden loam, I’ve doubted they would last long working in pasture grass–especially in clay soil. And why bother with a hand-held one? Your thigh muscles are far stronger; even in a garden bed you will put needless wear-and-tear on your shoulder, elbow, and wrist using one of those handheld jobbies. It turns out, before I got to the daffodils, I discovered some colchicums that should have been planted long ago. I decided I wanted to plant them among some purple-flowering hardy geraniums. I decided to use the Pro-Plugger so I would disturb the geranium’s roots as little as possible. 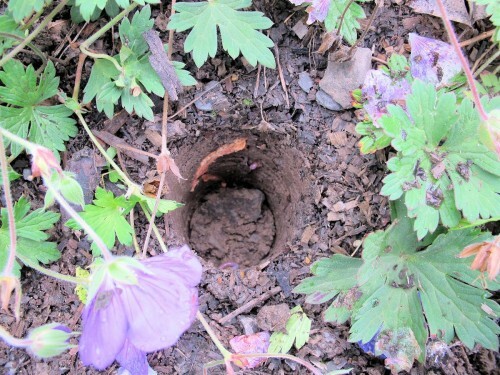 Here’s the hole the ProPlugger made in my clay soil, round and flat-bottomed. It’s a lot easier to place bulbs in these holes than in the holes I made with the planting bar in previous years. 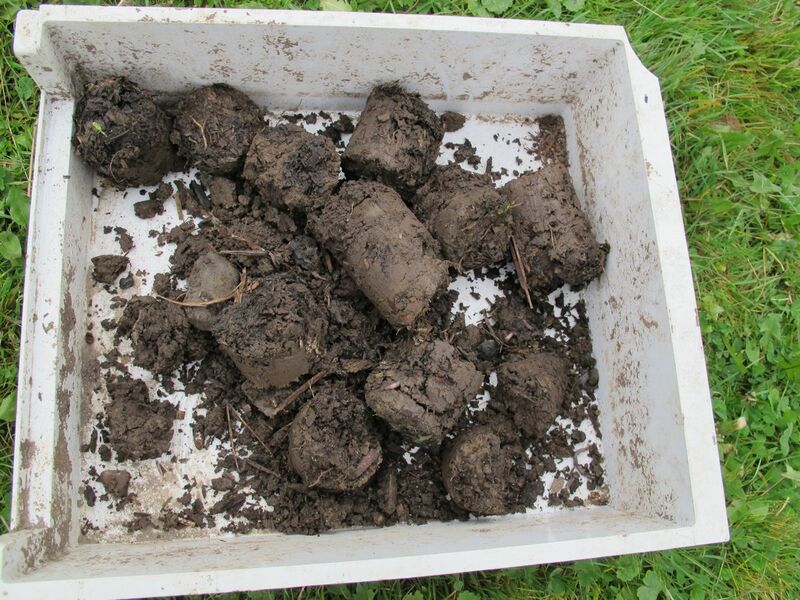 In clay soil, the plugs hold their shape pretty well. I decided instead of crumbling them up to fill the holes, it was easier to just push each plug back in the hole it came from. The instructions state that you should only use the ProPlugger in moist soil. I am repeating this common sense advice because I have seen what can happen to even a well-made, sturdy tool in the hands of a young man who lifts weights and is determined to get the job done today, dry clay soil not withstanding. Also, don’t expect this tool to slice through rocks. It ain’t going to happen. If you have rocky soil, this may not be the tool for you. 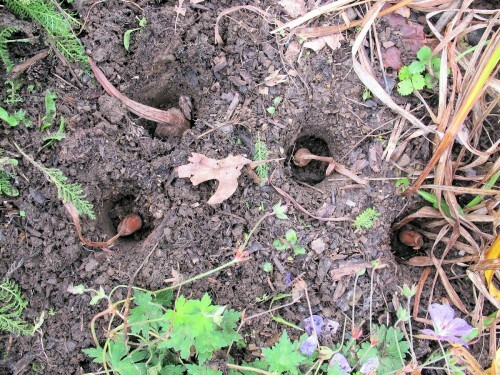 I have rocky soil, and I often could not push the ProPlugger to its full depth with my foot. This did not deter me. In the picture at left (click on it to enlarge), I could only get it down three inches before hitting a rock. (You can see the rock at the bottom of the previous picture of the hole.) I either moved the ProPlugger a bit to the left or right and tried again, or decided the hole was deep enough for my purposes. When you are planting bulbs in bulk you can’t be that fussy. 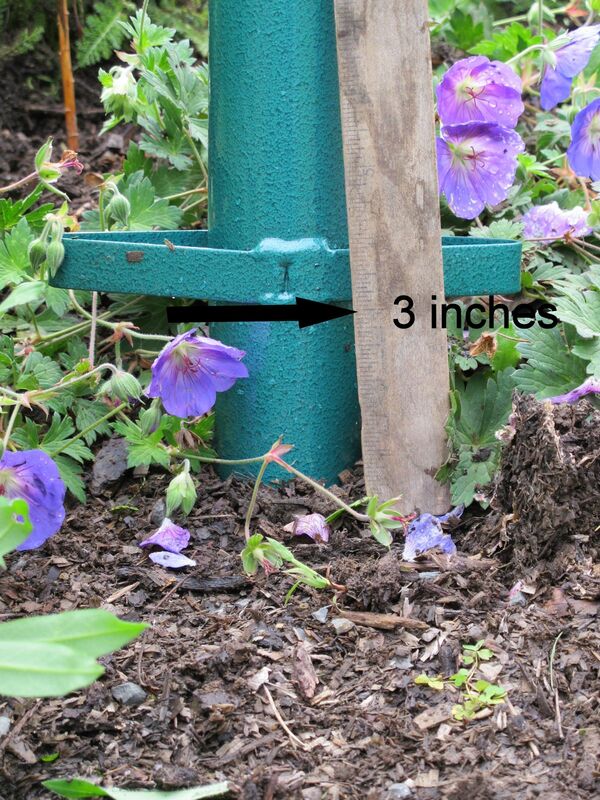 After the colchicums, I used this tool in several other planting situations. I planted daffodils around pine trees bordering the parking pad. I had a helper for this job. I made the holes, and she placed the bulbs in the holes and plugged them back up. This way I didn’t have to bend over. The ProPlugger can slice through small roots, and I felt it disturbed the roots less than digging would have done. I was given a bunch of bare root black-eyed Susans, and I used the ProPlugger to plant them in the far bank of the brook out back. After placing a plant in the hole, I turned the ProPlugger upside down and pointed it directly at the hole I had just made. The soil plug went straight back into the hole it had come from, with a stomp from my foot for good measure. I found this worked better in the tall grass than making a bunch of holes and letting the plugs accumulate in the tube of the ProPlugger. I kept losing holes in the tall grass, so doing them one by one saved time in the long run. 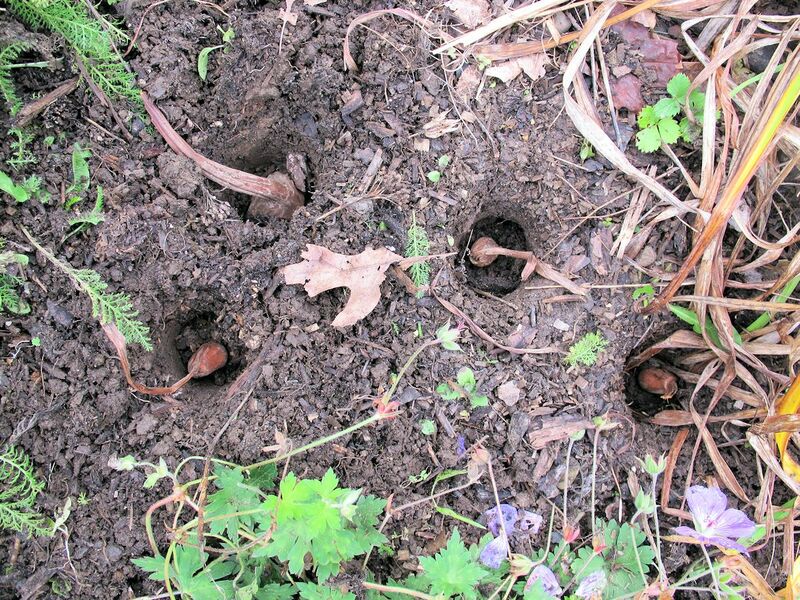 My favorite use of the ProPlugger is to plant bulbs among established perennials, where you don’t want to dig a wide hole to plant a dozen or more bulbs at a whack. The rocks that are most likely to stop the ProPlugger cold have usually been removed from garden beds, and you can artfully intersperse the bulbs around the establish plants without disturbing them much. With large bulbs like daffodils the job goes fast and it’s even kind of fun. There’s something about tipping the tool over and watching the plug slip back into the hole it came from that appeals to the kid in me. In the video below, Bill mentions some other uses for the ProPlugger. I rarely plant annuals en masse, and when I do plant out seedlings or small plants I prefer to break apart the root ball and plant the roots over a mound of soil, so I don’t think I’d use this tool for that. I can see it working well to insert plugs of lawn grass, fertilizing trees, or taking soil samples to be tested. My takeaway: this is a great tool for mass planting, especially planting a lot of bulbs around established plants or incorporating bulb plantings into rough areas such as fields and banks. It is well made and durable and reasonably priced. If you do a lot of large scale plantings, the ProPlugger is worth investing in. I received the ProPlogger in exchange for reviewing it on this website. I did my best to provide a balanced, unbiased review of this product. In Hawaii we often start lawns with plugs of grass. This looks like a tool I could use to cut plugs of grass from one location and transfer to a location that could use some help. Thanks for your review. My retired brother in law is obsessed with bulb planting (A.K.A. feeding his squirrels.) I think I just found his next B-day present. Oh, yes, it would be an excellent gift for a bulb fanatic! A very good review on the ProPlugger. 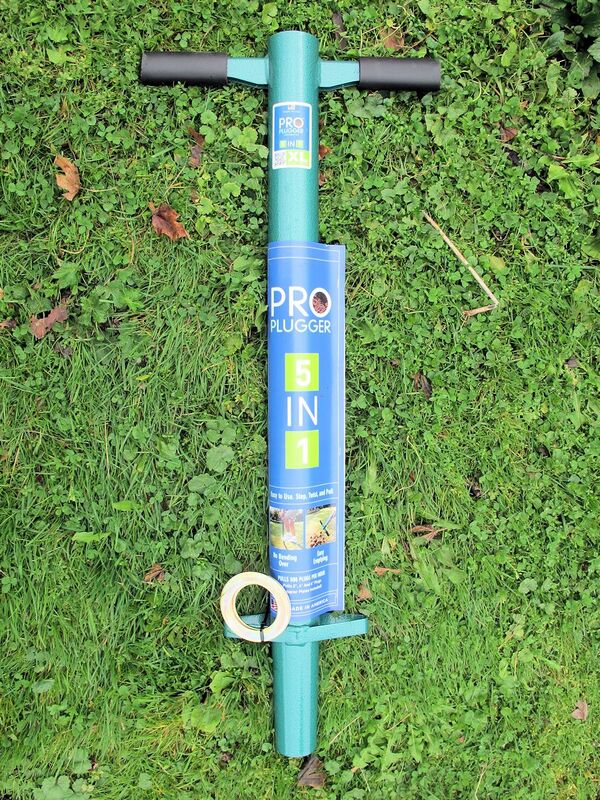 You deserve it, not only because you will truly use it often, but also because your review also incorporates tips that though common sense (eg, to use the ProPlugger in moist soil), may still slip some excited gardener’s mind. This looks like a massive time saver. I’ll have to wait until next time – my bulbs are already in the ground now. This looks like a really cool tool! 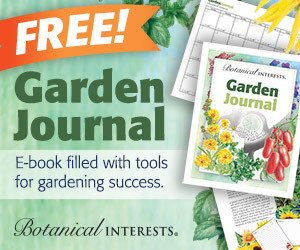 I can’t wait to see what pops up on your garden blog in the spring! I wouldn’t mind trying this tool out, but I am thinking about the small boulders and large rocks I usually encounter…it could work well in my lawnette. I figured it out. No problem. 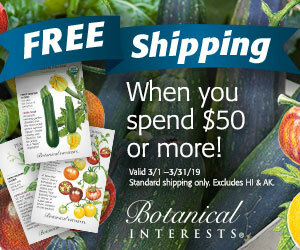 Looks like a good tool for a lot of planting occasions. I don’t often run into rocks so I bet I could plant fairly fast with this, especially if I had a helper like yours to put the bulbs in the holes and fill them in again. Good review! This sounds like a real handy tool. Trouble is that I don’t think I weigh enough to use it. I jump up and down on a shovel and it never makes it in the ground more than 1/2″. Interesting tool Kathy…I have often wanted a bulb planter that can take my clay soil and spare my hands from digging all those holes. Otherwise I think I will just stay with my “pointy stick”, a piece of wood whittled into a point. If you can plant bulbs with a pointy stick you have far better soil than I have here. Looks like a nifty tool. Can it penetrate granite? LOL Lots of ledge here but I would give it a try. What might that reasonable price be? The very first linked ProPlugger takes you to Amazon where it is sold for just under fifty dollars.